With the release of Free Birds I thought I’d do a little research on animated movies focused on birds. They have a patchy track record and I have some theories about that. But here’s a good list of the most memorable ones of recent years. Happy Feet (which I was lucky enough to work on) was a bit of a surprise hit at the time, and even went on to win an Oscar. It racked up a lot more money many than I think most people expected. I don’t remember Rio being considered a huge success at the time (maybe I had my head under a rock), but it does seem to have earned pretty good money. There was a lot more competition by 2011 and most animated features were being treated as a failures if they didn’t do over $600 Million. Both secured sequels though. I animated my first character performance with a bird back at university on a short film. The bird was a stylized Raven, and I found out then just how hard it is to pull off a full range of relate-able human emotions with a beak, eyes that are typically on opposite sides of the head (not seen side-by-side), and wings instead of hands. Not all of these films are about flight, but flight can have it’s problems too. Being in a vast void with nothing nearby can make it hard to establish speed, obstacles, relative positions to other characters etc… and it takes away many of the more common crutches most films have to establish tension during action scenes. I hope Free Birds does well, for the sake of broadening the animated film market. But it’s a very hard sell convincing a broad audience to watch a movie about Turkeys. I predict some obvious headlines. Fortunately Reel FX has a few features in development so I think it has a few shots at establishing itself as a major player in features. I do, actually, have a secret agenda here. 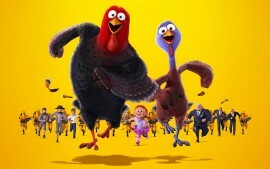 I hope Free Birds earns some good box office numbers as I have chosen it for this season’s movie draft (like fantasy football but with movie box office, and no money involved). Michael Cawood is a multi-award winning British Animated Filmmaker with a broad skill set. Having worked in animation since 1994, he's created Films, Commercials, Games, Short Films and Animated Series.